I was a fifteen-year-old holding an old Spanish acoustic guitar, as I strummed the chords. I closed my eyes and imagined myself performing on a grand stage. The crowd was cheering for me, as photographers snapped my pictures. I opened my eyes. "I'm going to be a rock star!" I knew this was my life's mission, and so, at the age of fifteen I embarked on my journey, never looking back. "You are it, we are going to make you huge! Sign here"By the time I was eighteen I had already written a few songs, had taught myself how to sing and play the guitar and performed on numerous stages. But that was for amateurs. I dreamed big! I wanted a record deal. I wanted fame and fortune. I couldn't focus on anything else, it had become my passion. My whole life revolved around my music career. I put a band together and started performing on small stages all over Toronto for more exposure. But things weren't moving as fast as I wanted them to, so one day I heard about an audition that was taking place for women performers. The grand prize was to record in a studio. On top of that, the performers got to sing in front of some very important people. I was the seventh woman to audition in front of the panel of judges. I sang for what seemed like twenty seconds when I heard "Thank you, next!" "That's it? I didn't even get to the good part!" Disappointed, I walked off stage and went back home thinking that it didn't go so well. The next day I received a few phone calls from that audition. One of them was from the Director telling me I made the cut, the two others were from management companies. I met with one of the management companies who told me "You are it, we are going to make you huge! Sign here." I signed to a three year management contract. Now things were moving. I quit the Fashion Design program I was in and took a day job as a waitress. I spent my time mostly in the studio, writing new songs, recording the old ones, working out five days a week because the competition was high and a girl had to look a certain way if she wanted to be noticed in the music industry. This went on for months until one day I decided I needed break. I heard about a ten day, free trip to Israel. I applied and was accepted. In Israel I rediscovered my love for the land I had left eleven years before. The people, the language and especially "that feeling" I got when I landed stayed with me after the trip was over. As soon as I returned to Toronto I received a call from my manager telling me that we were off to Nassau, Bahamas to make music. I felt my career taking off any minute. I started feeling like a true rock star. We spent a month in Nassau writing songs, tanning on the beach and recording. My next door neighbor was a Hollywood celebrity who was shooting a movie on the beach near our residence. A very well known band was recording their twelfth studio album just up the street from us, and on the other side of the island was another world famous rock star. "Now I'm one of them. They don't quite know me yet but just wait." Upon my return to Canada I was to do a very big showcase of my new songs to many people of the Canadian music industry. I knew that a record deal was just a matter of time…I felt it at the tip of my fingers. A few more months of waiting, working in the café and making music. But I found that I was getting impatient and frustrated with my lifestyle. I always wanted spirituality. I thought sitting cross legged on the floor, burning incense while listening to Ravi Shankar, my favorite Indian composer, was it. So I went to a Buddhist Temple to hear some ideas. After a few months I decided that this was not for me. My best friend had just returned from a trip to Israel. She was super excited about all these new concepts she had just learned. But to be quite honest, I had no interest in what she was saying, and found these ideas boring and not relatable. So she invited me to her rabbi's house. "Me? To a rabbi's house? I don't think so." But soon enough I relented and off I went. I found that I was getting impatient and frustrated with my lifestyleIt was a pleasant surprise. I found myself alongside a young couple sitting at the table and discussing interesting and deep ideas. I had a great time and was invited again and again. I started learning about what it means to be Jewish and hearing Torah values for the first time. I had always thought that The Torah was a book with many stories in it, but didn't realize there was anything else. I never attended Hebrew school so I didn't have any background. At the same time I was becoming better known in the industry. My manager kept telling me that it was just a matter of time before I got the record deal. I decided, during the waiting period, to go back to Israel. This time to learn more about my Judaism. Before I left I was to perform for two people. The first was the President of Universal Records; the second was for an A & R rep for Sony Records. This was going to lead me to the big break I was waiting for. Those four weeks in Israel had a great impact on me. I was learning, traveling the country and living in Jerusalem. For the first time, my existential questions were being answered. The answers made all the sense in the world to me. "What am I supposed to do with all this information?" I wasn't sure. I wasn't ready to change everything! I knew I wanted to keep Shabbat one day, but not quite yet! When I returned to Canada my manager told me that Sony was impressed and wanted to sign me to a five year record deal. I was elated. My dream was in front of me. But was it still my dream? I thought of the beautiful family lifestyle I had experienced in the Orthodox world, with the husband and wife speaking to each other so lovingly and respectful. I thought of the beautiful ideas I heard about women's dignity and the unique and powerful role of the Jewish woman. Something changed in me, my views on life were altered by something I had never been exposed to. If you had asked me four years prior "Who are you?" I would have answered, "My name is Moran, I'm a singer. I'm also Jewish." But at that moment if you would have asked me "Who are you?" I would have answered "I'm a Jewish woman." It was very clear to me that if I intended on growing spiritually in my newly discovered 'Jewishness' I couldn't enter a world of working on Shabbat, dressing a certain way and in general being in an environment totally antithetical to Jewish values and ideas. It didn't feel right to turn my back on all the new information I had attained. I knew I had to do something with it. I turned down the record deal. I told my manager I could not go through with it. I put my songs on the shelf along with my acoustic guitar, I had no idea how my music was to fit in with my new lifestyle. I enrolled back in college and applied to a program for Jewish study for women in Jerusalem. I was to go for only three months. My dream was in front of me. But was it still my dream?Three months turned to nine and during this time I began playing again, not only singing but also sharing the story of my journey. This time to a female audience, all over Jerusalem, to women of all walks of life. I discovered that also in the Orthodox world people thirsted for good music and inspiring stories. Women were so thankful and the feedback was amazing. Upon my return to Toronto, a very well known philanthropist in the Los Angeles Jewish community offered to send me back to Israel to record a studio album. I immediately agreed and I was back in Jerusalem within four months. In 2008 I released my fist album "Back in Zion." I also married my soul mate and in 2009 gave birth to a beautiful baby boy. Today I continue to inspire women by sharing my music and my story. I hope to have touched women's lives in a way where they see that although I turned my back on a 'high profile' music career, I still bring music to the world. I'm still living my dream while maintaining a strong Jewish Identity. If you ask me today "Who are you?" I will say "My name is Moran Sabbah and I'm a Jewish Woman." 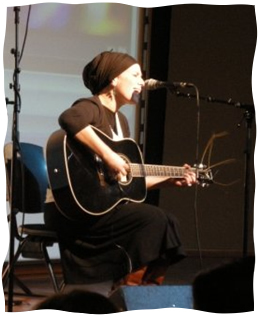 Moran Sabbah (nee Rotman) has been using her talent of singing, playing guitar and writing songs for thirteen years. She continues to perform all over for all types of women and hopes to do an American tour in the near future. For more info on upcoming shows and how to purchase her album go to www.moransabbah.com. answered prayers! My daugther wanted to be a rock star since the very young age. She dreamed of big concerts ,stages, success and fame. My husband and I, sighing heavily , followed her to concerts and performances on stages and always repeating the same to her "is this a life for a jewish girl? is that a future? how are you going to find a nice jewish husband? when are you going to settle down and have children?We tried to support and prayed, always prayed for her to change her way. Hashem listened and did change. My daugther become religious. Today she is a great inspiration to many young artists in the orthodox community a role model to young women. she is our pride and joy. Is it possible to get your email? Is it really a good thing? I get that you put your dreams aside for orthodoxy- as I did, as many woman have done and continue to do. You are still new to everything- your soulmate, Israel, family life. I also was offered a music deal from Sony, and I also turned it down and a few years later I realize that I made a huge mistake.